The beating of the windshield wipers fought to keep up with the pummeling rain, and I could hardly see through the glass as I slowly inched my rented car along the deserted road at dusk. I saw a small arrow-shaped sign on the right side of the road and came to a complete stop a foot in front of it, trying to read between wiper strokes. I was almost sure that it said “Firriato,” and so I followed the arrow’s direction and turned on a long narrow road, drove through an open gate, and eventually climbed a steep natural stone drive up to a small village. My mission here: To explore the Etna DOC (Denominazione di Origine Controllata) wine region and to find out what was percolating on Mt. Etna, other than the still-active volcano. I could see a courtyard and a ground-lit path on the other side, leading through vineyards to an elevated structure, glass walls proudly displaying the inside of a stream-lined tasting room begging for my approach. Comfortable in the warmth of the tasting room, I ordered a flight of their wines: Firriato’s Etna Bianco DOC, Etna Rosato DOC and Etna Rosso DOC. It was my first tasting of the local wines, and I had waited to try them until I was actually on Mt. Etna. I’ll skip right to my favorite part of the tasting: Etna Rosso DOC. The Etna DOC correlates to a region in the northeast of Sicily, a crescent-shaped area that wraps itself halfway around Mt. Etna. Etna Rosso consists of Nerello Mascalese and Nerello Cappuccio grapes indigenous to the area and often grown on vines that are 100-plus years old, vines miraculously saved from the Italian phylloxera of the late 1800s to which so many Italian vineyards fell victim. The small, round grapes with thick, almost black skins, make unmistakable Burgundian-style wines often compared to Pinot Noir. 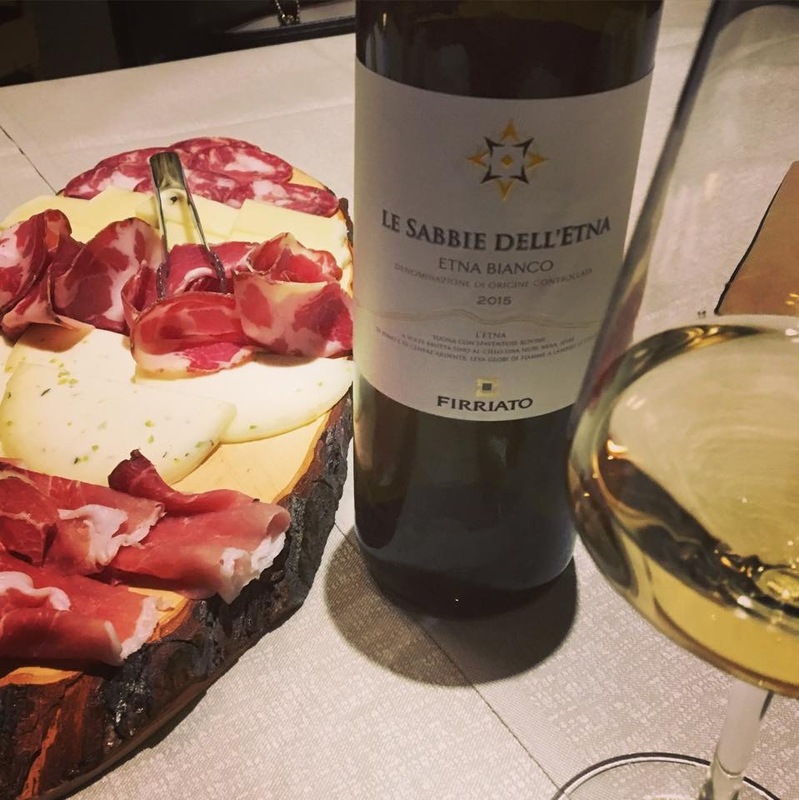 On Etna, they are grown at high altitudes and cultivated with the alberello (“small tree”) training system to keep each vine’s grape yield minimal for maximum flavor expression. One might assume that the roots of these vines would be exceptionally hearty to grow in the hardened lava of Mt. Etna, but the opposite is the case. The porous lava rock and soil make it easy for vines to penetrate. And vines grown in this lava earth give their grapes a definitive mineral flavor unique to volcanic regions. Minerals, climate, and the Nerello grapes culminate in wine that has wine critics cheering. Three of the winemakers best utilizing the ancient vines and indigenous grapes of Etna DOC are Graci, Cantina Benanti, and Tenuta Delle Terre Nere. At the Graci Winery in Passopisciaro, Sicily, I spent some time with the owner, Alberto Graci, walking his Contrada Arcuria vineyards and touring the old wine-making apparatus still on display but unused, at his newly modernized winery. Graci is so enthusiastic about the potential for Mt. Etna indigenous grapes that he became the vice president of the Consorzio di Tutela dei Vini Etna that covers 300 hectares of Etna DOC. He shares challenges and new ideas with his fellow Consorzio members so that they can — as a group — produce higher-quality wines. He tends and nourishes this local association of Etna wine makers with the same sort of care that he heaps upon his grapes. And that care should bear fruit; Graci’s wines have won acclaim from the world’s top wine connoisseurs (93 points, The Wine Enthusiast, 2014). While the Etna DOC fan focuses on the Marcello Mastroianni grape, most winemakers combine it with its cousin, the Nerello Cappuccio. Nerello Mascalese is the wine’s dominant partner since it must be at least 80 percent of the blend to qualify as Etna DOC. Wines made with Nerello Mascalese have a dark red fruit character with herbal and mineral notes. Full-bodied and sweet, Nerello Cappuccio adds a bright ruby color to the blend. The combination produces wine with structure and elegance, the hallmark of Etna DOC wines. But if Nerello Mascalese is the Marcello Mastroianni, the Nerello Cappuccio is his oft-overlooked understudy. Cantina Benanti owns most of the roughly 20 hectares of Nerello Capuccio in Sicily and is one of the wineries producing straight up Nerello Cappuccio as well as straight-up Nerello Mascalese. Because Etna Rosso DOC requires a minimum of 80 percent Nerello Mascalese, Nerello Cappuccio is not Etna Rosso DOC, but Sicilia Rosso IGT (Indicazione Geografica Tipica). If you visit the Benanti vineyards in Viagrande, Sicily, the first part of the wine tasting takes place at a wooden table set in the middle of the vineyards. The final tasting was presented inside the main house at a dining table filled with cheese, olives, honey, and charcuterie as a fantastic backdrop to the highly acclaimed wines. And, let’s not forget about the vineyards. 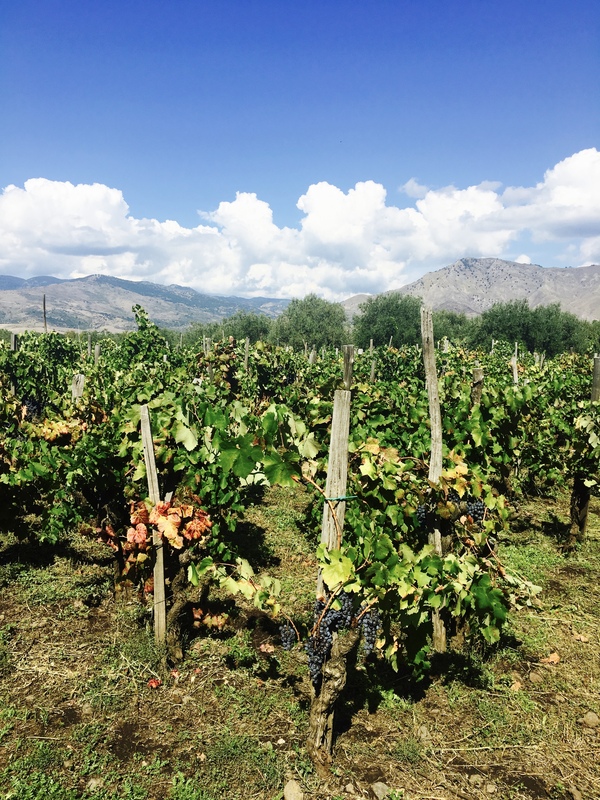 Throughout the Etna region, Nerello Mascalese and Nerello Cappuccio grapes grow interspersed together in non-linear vineyards. This growing structure makes for breathtakingly beautiful terrain, like Benanti’s vineyard on an old Roman cemetery and Tenuta Delle Terre Nere’s untamed hillsides. Now when I think of Etna vineyards, what comes to mind is the Nerellos, with their little black grapes hanging like jewels from ancient, gnarled vines, growing in the shadow of a percolating volcano. Tenuta Delle Terre Nere’s Etna Rosso DOC 2014 “Santo Spirito” $58 available at Backroom Wines, 1000 Main St., Napa, (707) 226-1378. Benanti Il Monovitigno Nerello Cappuccio Sicilia IGT 2013, $33.99, available at Flatiron San Francisco, 2 New Montgomery St., San Francisco, (415) 780-1405.